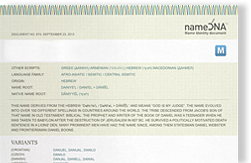 This name derives from the Hebrew “Nethan'êl / Netan'el”, meaning “God has given, gift of God”. It is etymologically related to the first names Nathan and Jonathan. It is the name of a character in the New Testament, often identified with the Apostle Bartholomew (whose name would be Nathanael Tolomai Bar, where Bar Tolomai 'Bartholomew', means "son of Talmai"). In English, the form Nathaniel has been in use since the Protestant Reformation, replacing the form Nathanael which is also used in most English versions of the New Testament. Nathaniel is both a male name and surname.